Mike C was fiending to get his fish on. Unfortunately, after an inch of rain everywhere 2 days before, most streams were at 3-4 times normal spring flow. 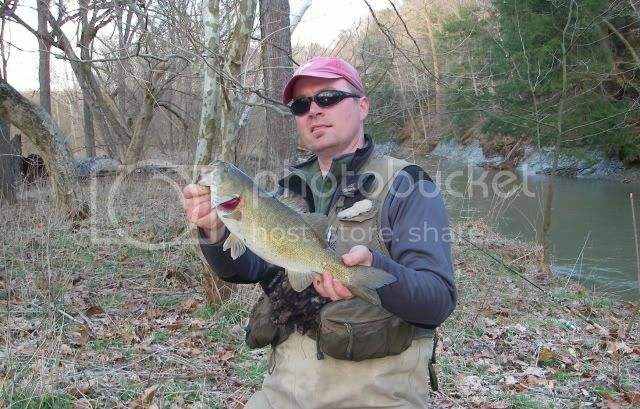 Our one local fallback suddenly raged and we took a wildcard and fished this stream for the first time this year. Visibility was about 4-6" current was up and fast. Sun was out and warming. All fish were caught in direct rays of the sun. Now usually, I wouldn't be excited to drive half across the state to hit high, muddy, cold water, but it was a challenge. 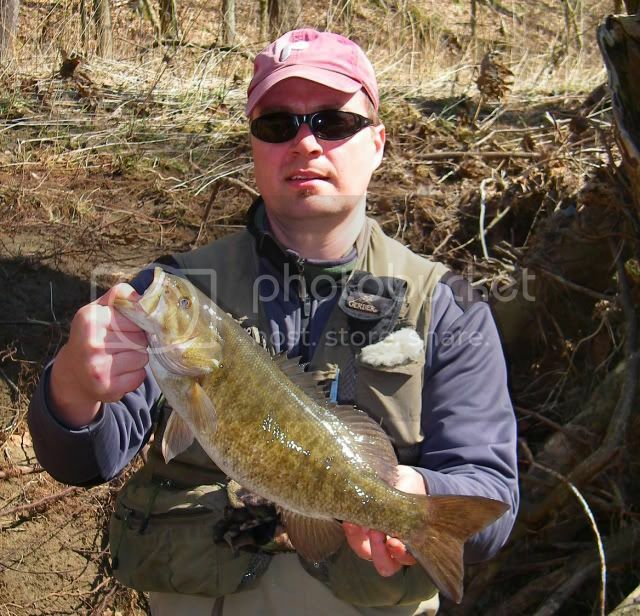 I met Mike and we got out to the water with a plan of hitting every feeder creek area we could hoping on clear inflow, shelter, and food attracting Smallies. The first 2 hours we hit a couple of different spots that were mainly muddy banks with plenty of silt everywhere. We were about to pack it in and go fish greenies when I decided to try what I thought was a wintering hole. Mike demanded we go try. While passing over the bridge Mike spotted a slack area with high bank and sun beating down. Furthermore, there was a small feeder feeding in between two sycamores. I tossed my recent lucky tube down the steep bank for the second sycamore 2' from the bank. My line got fouled on some plants, when I untangled it, I felt the 'twang' of a strike and set the hook by hand. 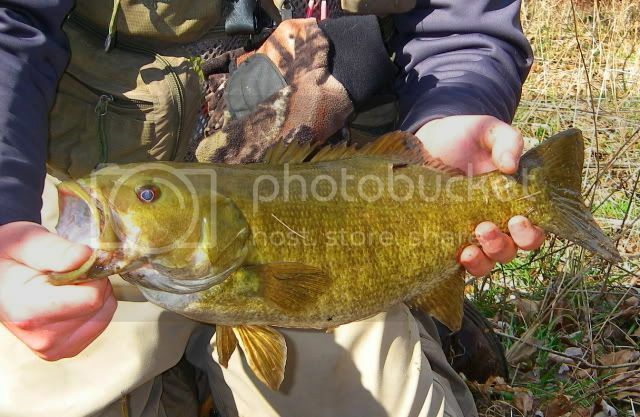 Grabbed my rod, it was a pretty large smallie that I had to haul up three feet onto the bank. We moved up dragging heavy tubes trying every current break we could for SMB. We hit a pocket area where a piece of turf deflected the current away. I again dragged a tube close to the bank along the protruding roots. A big fish 'thunked' again. It went 19.5". Pig fat. Mike got arty with the pics. Mike and I moved up a ways letting those spots cool, while trying to find a couple like it. The day burned and we returned to the spot where I caught the 19.5"er. Running one of my white Clatter-B's past the same spot mere inches from the bank, I saw a fish nail the bait. 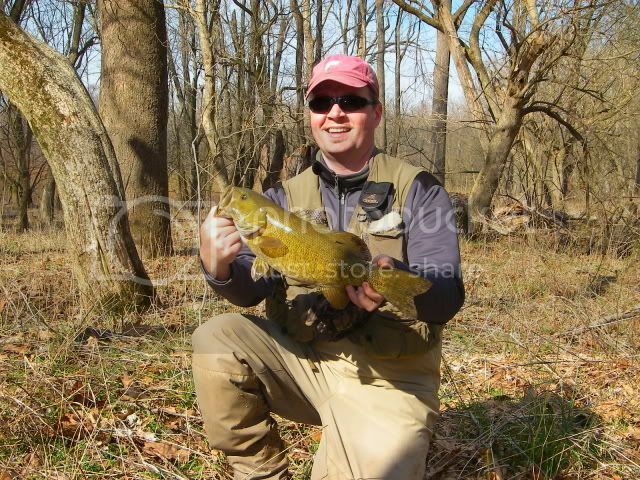 17.5" Then a few casts later a 15.5" first fishes I have caught on my home made baits- they work! Both were kind of a slow roll, the second being a hard strike. There's fish to be had in high water, work parallel to the shore as much as possible. Might have been an undercut bank there, but I'm guessing it would be nothing in the summer. Put in quite a few hours, and it really was only Mike's persistance that got us on fish. Funny how fate can sometimes lead to a lightbulb moment while fishing. Keeping bait in the zone close to shore was key. 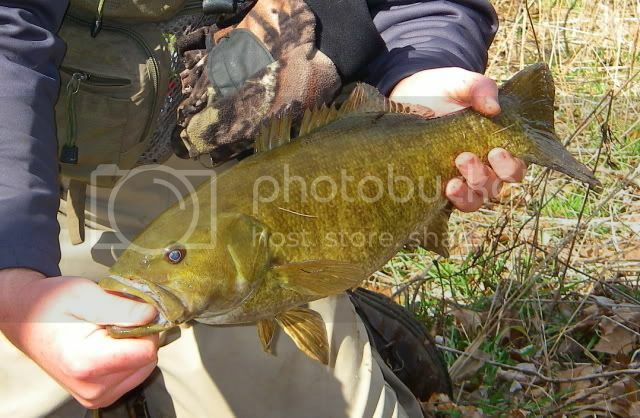 This time last year, I found similair size Smallies in shallow flooded flats. Warmer water, shelter, and minnows to eat.